Australia is a strong brewing country. Demand for filter coffee is high, and so is the standard served in cafés across the country and at competition level. Our roasters are commended for the quality of filter roasts through various competitions and increasingly, customers are interested in understanding what specialty brews are, as well as making and drinking them. As such, there’s no reason Australia can’t be considered among the top tier of coffee brewing nations. Unlike the barista competition, in which a coffee or coffees are expressed in multiple formats, the Brewers Cup, which celebrates the craft of filter coffee brewing by hand, allows you to explore and express one coffee in a really intricate way. 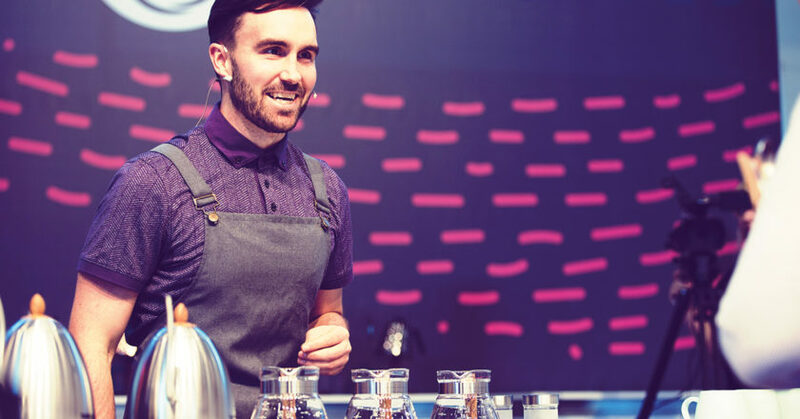 The format of the Brewers Cup competition encourages baristas to chase perfection out of that particular coffee or an experience they’re trying to create. In this event, there’s more emphasis on consistency throughout the judges’ experience and replicating it. What I really like is that the focus is not so much on explaining the preparation, but more on describing one coffee and the different ways in which you have adjusted all the variables to provide a particular experience or expression of the coffee. Sometimes it’s hard to see that although there are seemingly limited variables in brewing, the way in which those individual variables come together makes a world of difference. For example, you can have the same brew method, ratio, and same essential brew, but the way in which the water is poured across the brew bed of coffee grinds will ultimately affect the flavour. Anyone who tackles the Brewers Cup at regional or national level will walk away a much better brewer than when they started. In the higher tiers of competition, often there is criticism that only the high quality coffee is able to make it to the finals, but I don’t think the quality or calibre of the coffee really matters. What does are the choices you make: the preparation and ideas, equipment, and every aspect of the brew that you’ve brought into that experience. So although those high-end coffees are often rewarded on the scoresheet, what is more important is how the individual expresses the coffee, regardless of what it is. In order to achieve the best result on competition day, you have to be well-practiced, flexible, and open-minded to change. The format is moving more towards how the brewer can relate to what they’ve done in the brewing technique in regards to the coffee’s flavour, rather than rewarding information about processing and farming. I would personally like to see the focus head back to coffees that explore terroir, variety, and growing conditions instead of process-influenced coffees. While fantastic for flavour profile and expression, if someone brings a coffee that exudes subtleties, finesse, and delicacies, it may get lost in a sea of loud and bold coffees. We are seeing more flavourful coffees, which is great, but I’d like to see the competition reward diversity rather than one particular category or style of coffee. That said, these big and bold coffees do push the boundaries of what we can do. They challenge the range and spectrum of flavours we can experience, rather than just fruits and acids. We are looking for interesting textures, weights, even more savoury and sweet elements and how they add complexity. We’re seeing more unique methods of processing and preparing coffee coming out, and this is a very exciting time for coffee flavour, spectrum, and description. Each day, baristas try to discover the best way to express coffee, and we aim to achieve the same thing on the competition stage. We want to give the producer, variety, process, and origin the best chance to be expressed to the judges, and allow them to focus on what the barista or brewer wants to share from the coffee. That’s what I did in Budapest at the 2017 World Brewers Cup, and it’s nice to see the lessons being shared and carried into service in coffee shops and bars – that’s our goal at the end of the day. Sam Corra is the Head Roaster at Ona Coffee and the 2017 World Brewers Cup Champion Runner Up.